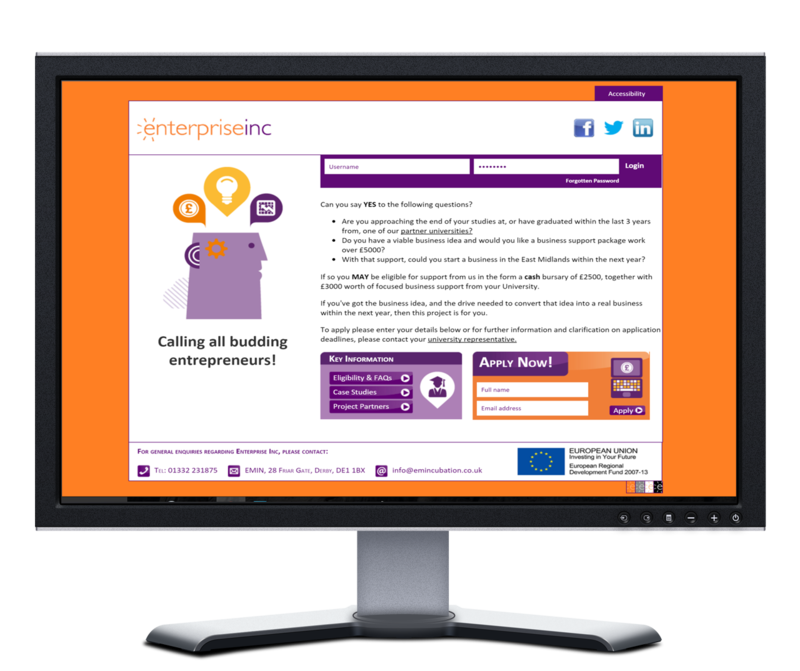 Enterprise Inc. is a project that aims to improve the enterprise skills of final year University students and recent graduates across the East Midlands. The management team required a system that would control the project from financial expenditure and milestone statistics to administration of the students’ individual progress. We designed a fully audited system that would allow four different users types to log on to complete their required tasks (students, university representatives, administrators and university staff). 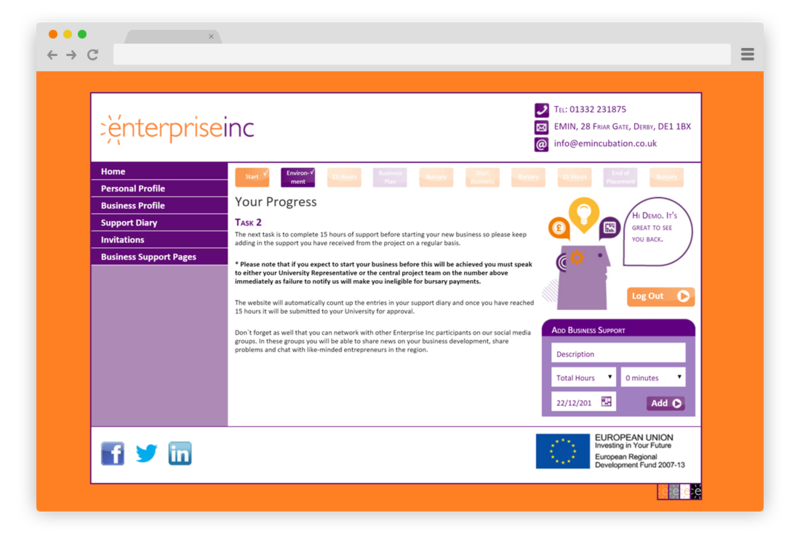 We created a front end that was controlled by a secure CRM system that stored all the information and triggered emails and notification. The system managed financial information, student application process and surveys and created documentation like time sheets. 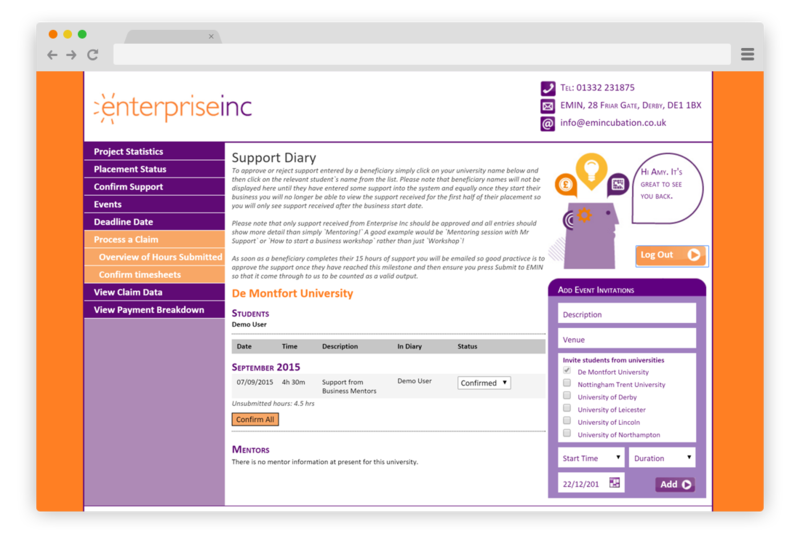 University representative’s accounts can access previous quarter information as well as submit current quarter claim figures and confirm time sheets. They can also control application deadlines, invite students from the university to other universities events and approve student business support records. Students do a minimum 15 hours worth of support in two stages. The two 15 hours of support are before and then after the students have set up their business. Student accounts have an easy to follow progress tracker that highlight when each section, or milestone, has been reached. The students can change profile information and business profile information from this section. They can add business support records for the university representative to approve. They also have access to a full range of business support pages to help them along with any questions or queries, for example tax payments, employment rights or legal issues. There is an option to build up a ‘shopping basket’ of requests so all requests can be sent in one email to the management team.